"I think if you did not sponsor me I may not be educate. ..... I want to be a doctor. " I am very glad to write this note. First of all, I would like to thank you for the entire sponsor you offered to me made me to learn up to this level. I think if you did not sponsor me I may not be educate. And I promised you that I will study hard to pass all my subjects in my exams. I would like you to continue to sponsor me up to the university. After my schooling I want to work for my country. 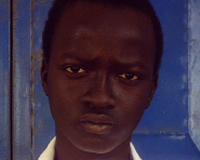 I am attending Muslim Senior School in Banjul. I am in grade 10. I want to be a doctor.